today we harvested the fava beans before the sun got too hot! 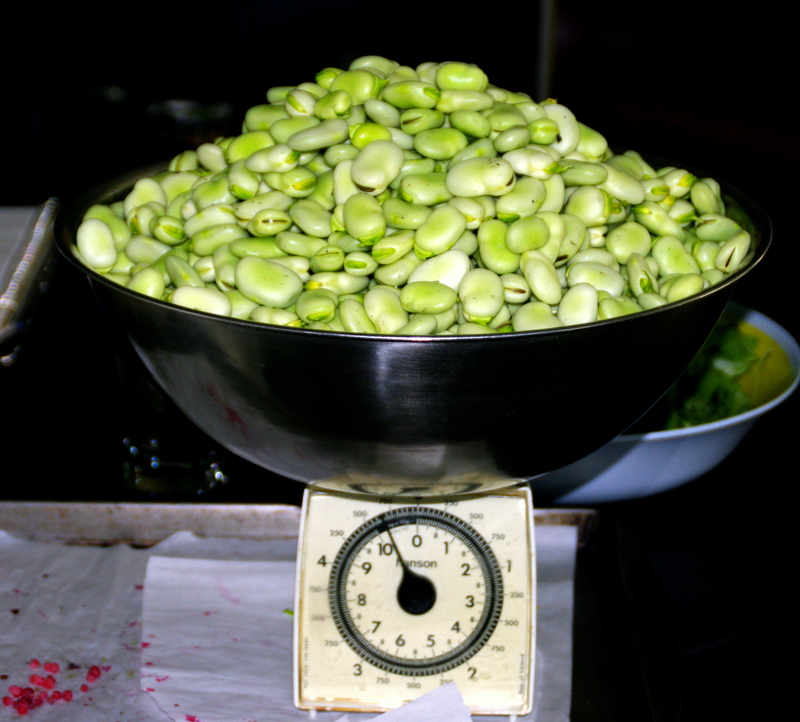 after shelling we had almost 5 kilo of beans ready to blanch and freeze. the garlic is in the dry down stage (no watering till the leaves are brown) we’ll pull it at the end of July as well as the spanish onions which are quite plump so early in the season. we’re finding it hard to keep up with raspberries, picking a litre or more every second day. same for the carrots, i planted three varieties of carrots! …what was i thinking? more than we’ll ever consume. most of the fennel has been picked and eaten, something that i will grow more of next year. like the carrots, there is a bumper crop of beets so we’ll be busy preserving those soon. turnips and kohlrabi are a hit on the bbq along with new potatoes (grown in barrels). the tomatoes are starting to shape up and it looks like we’ll have a great first crop of bush beans: green and yellow. the hard storage onions will keep us all winter and more if i can keep them going. the only disappointment this year has been the peas and the red onions, both slow to start and poor overall growth – one small harvest of peas and another to come at the end of this week. i will try a second planting of the peas in early august for a fall harvest. How do you cook your fava beans? I don’t cooked them very often: it’s hard to find them fresh enough in super market. Your blog is very friendly, thank you for sharing. We usually serve them as a side dish with wild rice, or …. Odette, I remove the large outer shell, but it can be cooked either way. To remove the outer shell blanch the beans for a few minutes and slip the smaller bean out. The inner, smaller tender green bean is the best, in my opinion. We got this recipe from our Italian neighbours, who taught me to cook them. They use the large bean but cook it the same way, however I find the large bean not as enjoyable. We also remove most of the rendered bacon fat, but it can be used, depending on individual tastes. Thanks a lot SWK, for your prompt reply.